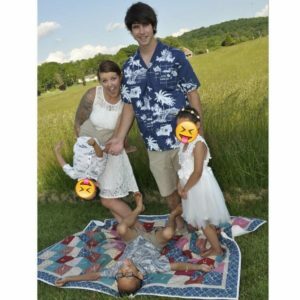 Fostering Makes a Difference- One Family's Story - People Places, Inc.
1) What drove you to become foster and adoptive parents? When I was younger my best friends parents adopted a little boy from foster care and I thought it was the most amazing thing. Years later when my husband and I got married we talked about fostering almost right away. We wanted to have our own biological children, but we felt compassion for all the kids without a family. 2) What has been the most rewarding and the most challenging aspect of this journey? Watching these kids grow and become their own person is the most beautiful thing to watch. Knowing that you had a part in giving them a happy future is such a great feeling. It can be very hard at times adjusting the different personalities and making them all work together. These kids come to you broken, and the struggle is real. But then there are big wins, and you see the progress, and you realize how much of a difference you’re making. 3) What stereotypes about fostering and adopting would you change if you could? What would you say to changes people’s opinions? A lot of people see foster kids as a nuisance. They don’t understand how terrible life has been for the kids, and how much pain they have endured. 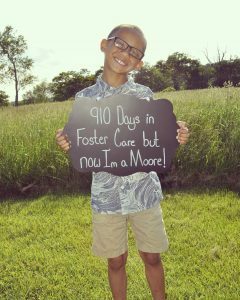 Foster kids just want to be normal kids like everyone else…They didn’t ask to be abused or abandoned. But as a successful foster parent, I can tell the other side of that story. When you give these kids love and structure, they start to grow and eventually they thrive. 4) Are there any activities in particular that you love doing as a family? If so, what? We love camping and really anything outdoors. We love all being together around a campfire or riding our bikes down the road. We do everything together. 5) What do you love most about being parents? Watching our kids grow so much. When they came to us they were scared and acting out from their pain. They didn’t really know what real love felt like. Now they are completely different people than when we first met. They make the same facial expressions as my husband and I, and tell the same cheesy jokes. They tell us they love us 5-10 times everyday. They appreciate the life we’ve given them so much, and we appreciate the life they’ve given to us! We never want to imagine life without them. 6) If you could provide one piece of advice to new foster/adoptive parents- what would it be? Just show them love. Look past their flaws and find their heart. When we met our son for the first time he was running around an office trying to throw a lamp. He didn’t eat with a fork and was extremely hyper. We wondered what we were getting ourselves into. If you told me then the amazing kid he would become, I would have never believed you. We showed him that he was loved. No matter how long he was going to be with us we were going to love him like our own. It completely changed him and us. And now, the same is happing with our other two foster kids. Love is the greatest force in the universe. It truly does change people for the better!